The Maharashtra police on Tuesday raided homes of prominent Left-wing activists in several states and arrested at least five of them for suspected Maoist links, sparking a chorus of protests from human rights defenders. The raids were carried out as part of a probe into the violence between Dalits and the upper caste Peshwas at Koregaon-Bhima village near Pune after an event called Elgar Paris­had, or conclave, on December 31 last year. Near simultaneous searches were carried out at the residences of prominent Telugu poet Varavara Rao in Hyderabad, activists Vernon Gonzalves and Arun Farreira in Mumbai, trade union activist Sudha Bhardwaj in Faridabad, and civil liberties activist Gautam Navalakha in New Delhi, a senior police official said, speaking on condition of anonymity. Subsequently, Rao, Bhardwaj and Farreira were arrested. Maharashtra police on Tuesday raided the homes of prominent Left-wing activists in several states and arrested at least five of them for suspected Maoist links, sparking a chorus of outraged protests from human rights defenders. The raids were carried out as part of a probe into the violence between Dalits and the upper caste Peshwas at Bhima-Koregaon village near Pune after an event called Elgar Parishad, or conclave, on December 31 last year. Near simultaneous searches were carried out at the residences of prominent Telugu poet Varavara Rao in Hyderabad, activists Vernon Gonzalves and Arun Farreira in Mumbai, trade union activist Sudha Bhardwaj in Faridabad, and civil liberties activist Gautam Navalakha in New Delhi, a senior police official said. Subsequently, Rao, Bhardwaj, Farreira, Gonzalves and Navalakha were arrested under IPC Section 153 (A), which relates to promoting enmity between different groups on grounds of religion, race, place or birth, residence, language and committing acts prejudicial to maintenance of harmony, said the official. Some other sections of the IPC were also pressed against those arrested, along with Unlawful Activities (Prevention) Act for their “alleged Naxal activities,” said the police official, without elaborating. In New Delhi, soon after Navalakha’s arrest, the Delhi High Court ordered police not to take him out of the national capital at least until Wednesday. The High Court was hearing a habeas corpus petition filed on behalf of Navalakha by his advocate Warisha Farasat after he was picked up from his Delhi home on Tuesday afternoon by the Maharashtra police. The premises of Father Stan Swamy, a tribal leader in Jharkhand, too were searched but he was not detained. Others whose residences were raided are photojournalist Kranthi Tekula and Anand Teltumbde in Goa. Koregaon-Bhima occupies a central place in Dalit history — it witnessed a major battle in which the Peshwa rulers were defeated on January 1, 1818 by the British army, comprising a large number of Dalit soldiers. Every year, the anniversary of the battle is marked by thousands of Dalits assembling in Pune and marching to Koregaon-Bhima to a war memorial. 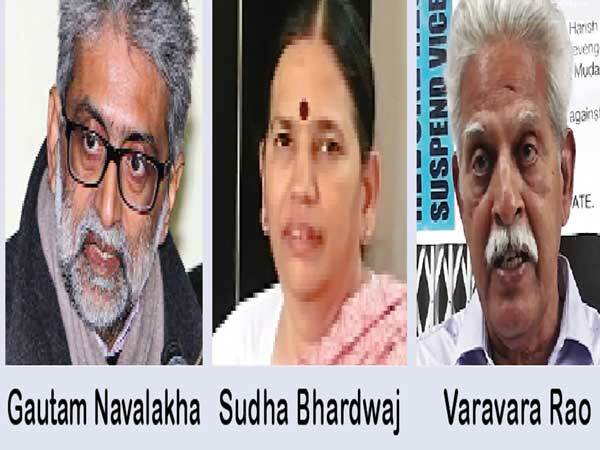 Today’s events mirrored simultaneous raids conducted in June when five activists were arrested in connection with the Koregaon-Bhima violence. The five were accused of having close Maoist links, according to an FIR registered at the Vishrambaug Police Station after the event. “While arresting them, we had seized some documents, and while scrutinising those documents the connection of these five people surfaced. Their exact role in the case is part of the investigation,” said the police. Officials said, two letters, purportedly exchanged by Maoist leaders, indicated plans to assassinate Prime Minister Narendra Modi, BJP chief Amit Shah and Home minister Rajnath Singh, leading to the police action. While a 2016 letter suggested that there were deliberations among the Naxals to kill Modi, Shah and Singh, a 2017 letter referred to a plan to carry out a Rajiv Gandhi assassination-type attack on the PM during one of his roadshows, they claimed. The second letter was addressed to one “Comrade Prakash” and was found from the residence of a Delhi-based activist, Rona Wilson, on June 6. The letters were reportedly recovered after the anti-Naxal operations in Maharashtra’s Gadchiroli, in which 39 Maoists were killed, in April. The 2017 letter also referred about “senior comrades” suggesting “concrete steps” to end the NDA dispensation and about raising several crore of rupees to buy American M-4 rifles and some ammunition, the official said. Rao’s name had figured in the second letter which the Pune police claimed to have seized from Rona Wilson’s house in June. Rao was arrested from his Hyderabad residence by a Pune police team, which earlier searched the residences of his two daughters Anala and Pavana. “Pune police sought our assistance. We have provided them with local force to assist in conducting searches and making the arrest. He (Rao) ... Will be produced in a court and taken to Pune on transit warrant,” said Deputy Commissioner of Police (Central Zone) Viswa Prasad. Interestingly however, outgoing joint commissioner of Pune police Ravindra Kadam, had on August 2 said that no Maoist links were found in the Koregaon-Bhima violence.